It's a time consuming snack but when it comes to the tasting part , Its worth giving a try. Wash and peel the skin of beetroot and carrots. Grate them. Add the ginger garlic paste and saute them well. Now add the grated carrot, beetroot and peas. Cook them well in a medium flame. No need to add water, as the water in the vegetables are sufficient. Add the turmeric powder, chilli powder and garam masala powder to it. Finally add the boiled potatoes along with salt and smash them well with all the vegetables. Heat oil in a pan. 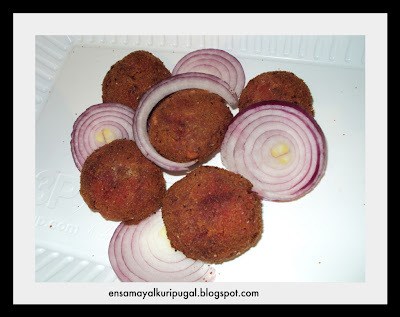 Deep fry these balls till they turn golden brown. OPTIONAL: THOSE WHO ARE DIET CONSCIOUS CAN SHALLOW FRY THEM . In a pan place the dusted patties , adding oil on its sides. when they turn golden brown flip and fry the other side in the same way. 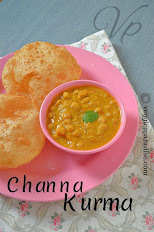 I too love it,but as u hav told,I am too lazy to make often,otherwise its a perfect snack for kids too! They are so beautiful. Why don't you send them to WYF teatime snack event happening at Simple Indian Food blog? I've had the pleasure of reviewing "VEGGIE PARADISE" and I'm pleased to inform you that your blog will appear on Blogging Women. Healthy & Yummy. Nice ones..
this is mine all time fav snack too.. Delicious and healthy Cutlets. 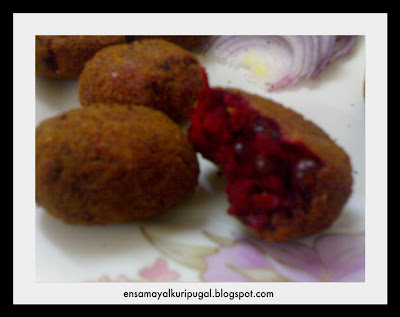 I love that you have added beetroot to the cutlets. I do that too and my friends are curious to know how my Vegetable cutlets have a beautiful red hue to them. Its a great way to make our kids eat healthy.